Search Results for "wright brothers"
1980s: A child looks up. The Spirit of St. Louis and Wright brothers' Flyer at the Smithsonian National Air and Space Museum. Wright brothers reenactors carry their Flyer on the beach. 1990s: Men wind propeller on experimental aircraft. Wright Brothers plane rolls across ground. Wright Brother's plane flies through sky. Squadron of military bombers soars through sky. 1980s: Wright brothers reenactors test their flying machine in Kitty Hawk. A modern passenger plane flies through the sky and lands. Space technology has become routine operation, a drastic progression from the days of the Wright Brothers and Robert Goddard. Arthur Godfrey talks about the history of flying in 1953 and demonstrates the Wright Brothers plane. The Wright Brothers make an impact on 20th century aviation. 1981 - Technical progress in the aviation field has come a long way since the Wright Brothers. 1929? A blimp flies over the Wright Brothers? 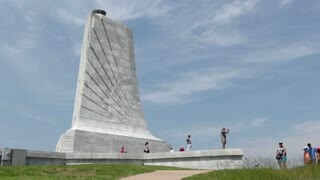 monument in Kitty Hawk, North Carolina, and a wreath is thrown to celebrate the 31st anniversary of airplane flight. 1980s: Wright brothers reenactors carry their airplane wings out onto the dunes. They do a test run with the wings. 1980s: View from a plane flying in a loop. Wind blows across a sand dune. 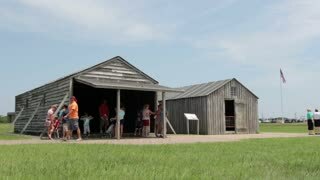 Wright brothers reenactors set up their flying machine. They run down a dune and one man stops to look as they release it. UNITED STATES: 1950s: wright brothers push plane along ground. The Vin Fiz Flyer an early Wright Brothers Model EX pusher biplane that in 1911 became the first aircraft to fly coast-to-coast across the U.S.
UNITED STATES: 1950s: men fly early aircraft from field. Wright Brothers. 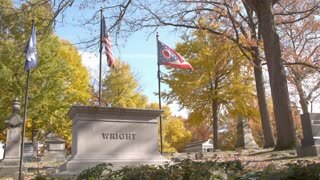 Ceremonies honor Eddie Rickenbacker and the Wright Brothers in the 12930's. 1953 - The early development of aircrafts up to the Wright Brothers. 1980s: Wheels touch down on a runway. The Space Shuttle Enterprise lands. Children and a woman look up. Wright brothers reenactors release their flying machine on the dunes of Kitty Hawk. 1980s: People look up and point at the aircraft in the Smithsonian National Air and Space Museum. Wright brothers reenactors carry their Flyer on the beach. 1980s: Wright brothers reenactor pull their flying machine to the top of a hill and then run down with it. The Wright Brothers National Memorial in Kitty Hawk, North Carolina, along the Kill Devil Hills, is shown in 1957.